Earlier on I wrote about Edinburgh’s first Woolworths – in Leith – which opened in January 1925, but it was over a year later before Edinburgh city centre gained its own flagship store (#213) at 10-14 Princes Street. As immortalised in the c1930s postcard below, the store occupied a prime spot on the corner of Princes Street and Waterloo Place, directly opposite the notoriously bracing Waverley Steps. 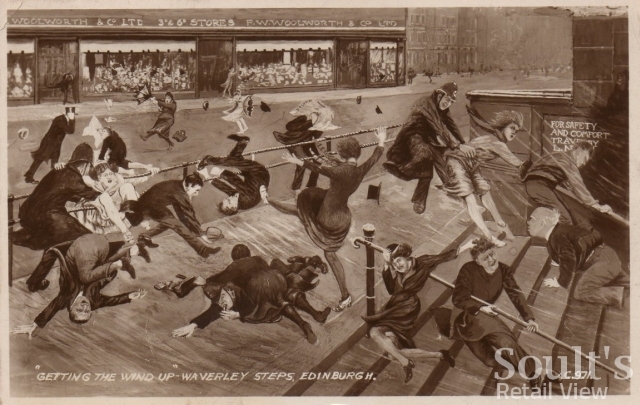 It seems fitting that I should visit Edinburgh the day before the revamped Waverley Steps opened to the public: a project that should make the ‘getting the wind up’ postcard scene a thing of the past. 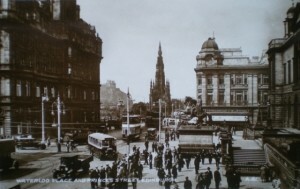 The Woolies history site at 100thbirthday.co.uk portrays the Princes Street Woolworths as not just a flagship for Edinburgh but for the whole of Scotland. Happily, the store’s prominent location and status means that it shows up in plenty of old photographs, such as the examples below (click to enlarge). 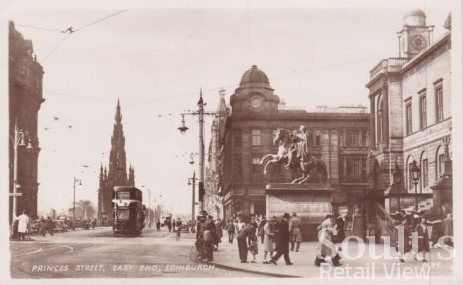 In typical Woolies fashion, the store enjoyed a succession of extensions and modernisations over the years, including taking over the site of the Palace Cinema, further along Princes Street, in 1956. 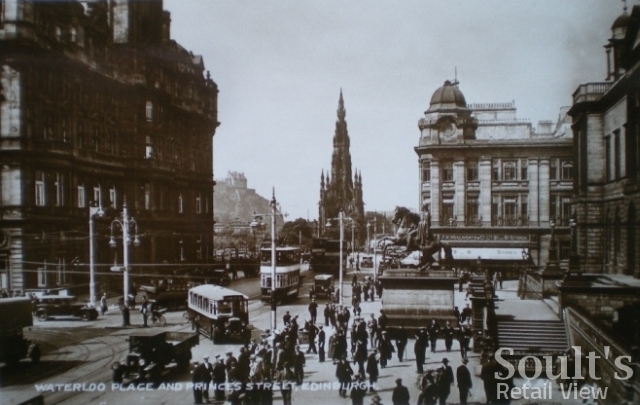 The cinema was demolished and a four-bay extension built in identical style to the existing nine-bay Woolworths frontage to Princes Street. 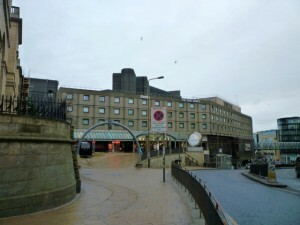 As was the typical fate of Woolworths’ biggest shops, however, the Princes Street store was promptly disposed of following Kingfisher’s 1982 takeover of F W Woolworth’s UK operations, closing its doors on 24 March 1984. 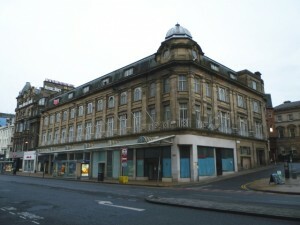 Unusually, though, the store’s closure left Edinburgh without a centrally located Woolworths store at all, unlike other large cities in the 1980s – such as Leeds, Sheffield and Newcastle – where a smaller store remained open even after the flagship Woolies’ disposal. 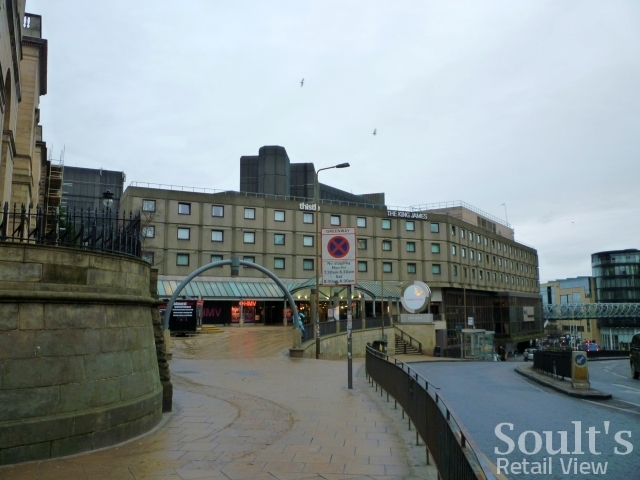 Until the chain’s eventual collapse in 2008, shoppers in Edinburgh city centre had to make do with the Woolworths stores in either Lothian Road or Raeburn Place – both a good ten-minute walk from Princes Street, and the focus of my upcoming third and final post on Edinburgh’s Woolworths. The Princes Street property, meanwhile, was divided up into a series of smaller shop units, which, until recently, housed retailers such as Waterstones, Evans, Boots and Burger King. 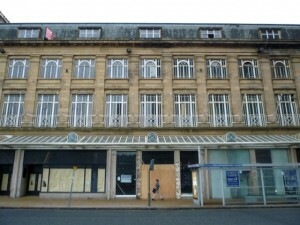 Now, however, the block is once again subject to refurbishment, involving a £12m mixed hotel, leisure and retail scheme that will complement the planned (and much-needed) redevelopment of the nearby St James Shopping centre – as the new St James Quarter – as well as the arrival of the tram. 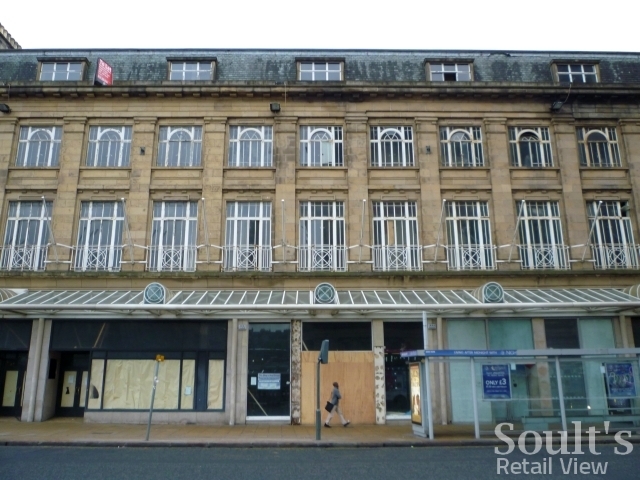 Princes Street’s former Woolworths, unlike the Leith store that I wrote about previously, is at least on the part of the route that is still going to be built. 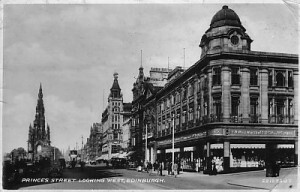 In the meantime, it’s quite nice how the departure of the previous retail tenants and the removal of their visual clutter briefly allows the building at 10-14 Princes Street to be appreciated as originally intended – as a single entity once more, and a reminder of when it played host to Scotland’s most prestigious Woolies.